One of our largest amphibians, the Smoky Jungle Frog, also known as Savage’s Thin-toed Frog and Central American Bullfrog, is a fascinating creature! 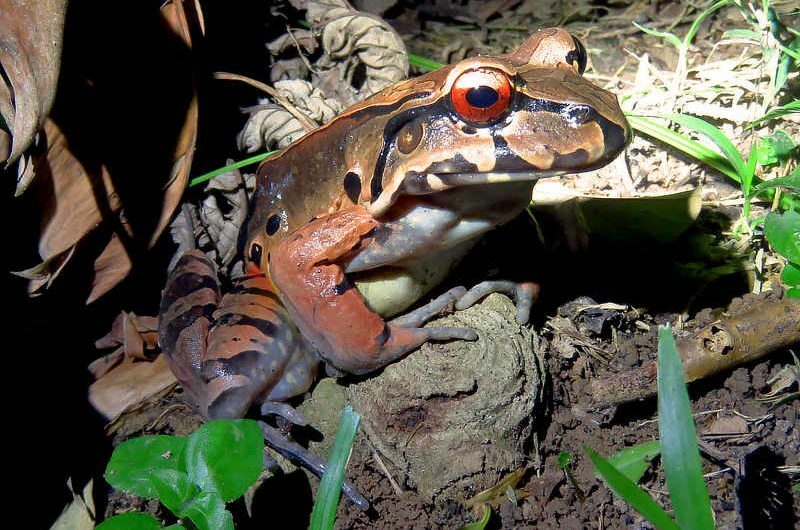 Growing up to 18 cm in length, this large frog has brown to bronzy coloration on its back with reddish-brown spots, has brownish thighs often with reddish spots, a black stripe on the tympanum (ear), and brown spots along its upper lip. It is nocturnal and terrestrial in its habits. Smoky Jungle Frogs are astounding jumpers and can evade capture and predation very quickly with long, fast jumps. Generally, they are easy to approach, and if grabbed by a predator or curious herpetologist, they emit a loud, high-pitched scream that stuns the predator, allowing their release. Built like a tank, the Smoky Jungle Frog is a force to be reckoned with! It eats just about anything—birds, chicks, snakes, frogs, invertebrates, and is the only frog known to eat scorpions! Even the tadpoles are carnivorous, and feed on eggs and other tadpoles, even of their own species! They, however, can also survive on a vegetarian diet. The tadpoles are tough—they are resistant to dehydration, and lab experiments show that they can last for up to 156 hours without water! Breeding males are recognized by their largely swollen arms. Male Smoky Jungle frogs call at night near ponds or small streams within or near forest during the rainy season. They give loud and ominous “whoop” calls to attract females and maintain their territories. When breeding, a male uses the spines on its thumbs to help grasp the female during amplexus. He also has a pair of small spines on his chest used in territorial conflicts. During breeding, the couple mixes water, air, sperm, eggs and secretions to create a foam nest containing 2-7 liters of foam, giving this group of frogs the common name “foam frogs”. The foam nest can contain up to 1000 eggs, each 3 mm in diameter, and it feeds and moistens the tadpoles during the whole metamorphosis process, which takes approximately 1 month. The Smoky Jungle Frog ranges from Honduras to Panama and bordering Colombia, and has a disjunct population in Santa Marta, Colombia. It is found in a wide variety of lowland habitats to 600 m, including primary and secondary forest, premontane tropical forest, edges and deforested areas. Large tadpoles can be found in streams, temporary ponds, swamps and foam nests, and can be seen around all Canopy Family lodges. The Smoky Jungle Frog was recently split (in 2005) from Leptodactylus pentadactylus of the Amazon basin.